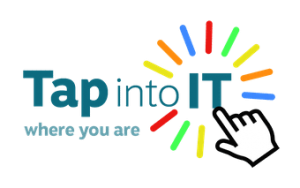 Tap into IT Where You Are provides an inclusive, locally accessible service and ongoing support to enable people to tap into the benefits of the internet and technology. Our services are aimed in particular at older people and those with disabilities and health problems in Edinburgh. We can set up your new computer and broadband connection for a small fee. Read more…. We offer 6 x 1 hour sessions covering computer, smartphone or tablet basics. Read more…. Book a 1:1 remote slot online today! Read how we worked around R’s communications issues as well as not having a device! Read B’s story about how we have helped him manage his condition. Read about how G enjoys attending the computer club despite her physical and communication difficulties. Read all About Tap into IT Where You Are! Best thing I have ever done coming to the club. Should have done it a long time ago. I didn’t feel confident enough about coming but now, even when I am in the house, I enjoy my ‘iPad’. I am on What’s App and the other day I talked to my daughter for about an hour. Everyone’s really patient and happy to explain things over and over again. Cake and coffee is good, too. I come to the club for company and I learn about the laptop at the same time. Assistance in problem solving when things go wrong. Technical help. Opportunity to socialise with other residents.